Tuesday 09th June 2015—There was a slight chill in the air this afternoon but the sun persisted and it was a fantastic afternoon of Kwik Cricket at Tor Bridge High. 6 teams came along today from our local primary schools to take part in our annual Tor Bridge Family Y3/4 Kwik Cricket festival. The children batted in pairs for 2 overs and everyone had a go a bowling. The standard of play was fantastic with some great shots being played and some big runs being made. I lost count of the number of boundary shots that I saw—we will definitely be encouraging some of these children to join their local Cricket clubs—you saw them here first! A massive thank you goes to the Head Teacher from Bickleigh Down Primary School, Mr. Hancock, and 2 of his staff who umpired the games for us on the day. Their fantastic support and efficiency with scoring kept the games on schedule and we finished on time! Thank you all so much—I am truly grateful (those score sheets looked very complicated to me!). My thanks also go to the young leaders from Tor Bridge High who were on hand to help the umpires, provide some advice/coaching for the teams and to help with the smooth running of the event. Thank you Mr. Williams for once again arranging for such quality young leaders. Tor Bridge ‘Atherton’ Team took home the trophy in the end having won all of their games. A very close second were Bickleigh Down A team who were also the team to score the most runs in one game (256!). Leigham Primary came 3rd, actually accumulating more runs overall than Bickleigh Down A team (by 2 runs) but didn’t win as many games—their run count was consistently high throughout the afternoon. The table below outlines the scores for the day. Congratulations to everyone who took part—it was a fantastic afternoon of Cricket and everyone played incredibly well. 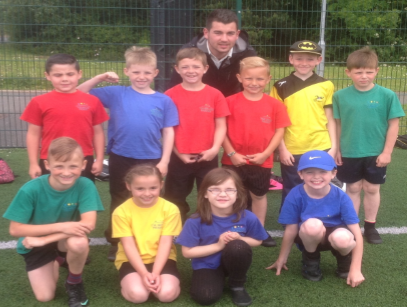 My thanks go as always to the staff and volunteers from the primary schools who brought along their children—I know that the children really appreciate all your hard work and time to get them to these events and so do I.
PE Specialist Teacher—Tor Bridge High.